We may do a minor update (soon?) 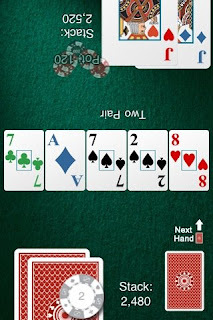 with a few new things in Heads Up: Hold'em. I made a deck of cards designed just for 1-player games which are not reversible but allow for bigger pictures. (Shown below) This screenshot also shows the "Devious Deb" card protector. Unlike the real-life Deb who is a very solid & straightforward poker player, this AI-player will be erratic--betting very small or large amounts, and slowplaying & bluffing a high percentage of the time. We are also (finally) including the option to use a 4-color deck. 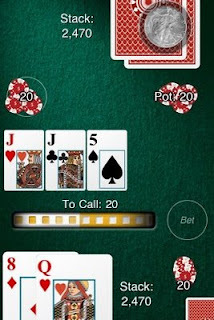 This was one of the first requests from real-life "Luckbox Larry" when he and I played the cards-only version with real chips during the development before the initial release. Incidentally, he won $10 (2*$5) off me in that game, plus I bought him lunch.